The families of six Britons jailed in India are "begging" Prime Minister Theresa May to help with their case. 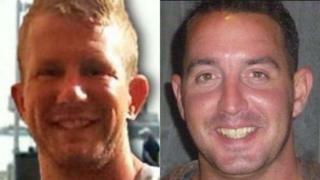 The former British soldiers were jailed in India for firearms offences. The men worked on an anti-piracy ship and were arrested in October 2013. They were jailed at a court hearing in January for five years. A Foreign Office spokeswoman said Mrs May would raise the issue with Indian Prime Minister Narendra Modi during a visit next week. Lisa Dunn, a sister of one of the men, told the Victoria Derbyshire programme she is "sick to death" of being told the UK government cannot intervene in another country's judicial system. An appeal has been lodged against their sentences, but a judge in Chennai (Madras) ruled the men will not be released on bail in the meantime. There were 35 sailors on the American-owned Seaman Guard Ohio, which offered armed protection to vessels sailing through an area known as "pirates' alley" between the Indian Ocean and the Red Sea. Customs officials and police found 35 guns, including semi-automatic weapons, and almost 6,000 rounds of ammunition on board the ship, which did not have permission to be in Indian waters. An Indian court ruled it was not properly licensed, but the men have consistently denied any wrongdoing. Nick Dunn's sister, Lisa, said the families have had an email from the Foreign Office saying it "expects" to raise the case, but that this is "not good enough". "Theresa May has the power the end this now, and that's what we want her to do. "She cannot waste this opportunity face-to-face with Modi, she has six British men at her mercy, and can't just waste it talking about her trade deals. There were six British soldiers who served this country and they need help. "It's an absolute travesty if she fails to raise it. The power is in her hands and we're begging her for help." John Armstrong's sister, Joanne Tomlinson, said that while the men have had consular support from the Foreign Office, "we feel there is so much more they can do". She added: "They have spent more than 18 months in prison now, and we feel there must be more diplomatic pressure that can be put on [India]. "Six of our veterans are imprisoned there. They should be speeding the legal process up." Billy Irving's partner, Yvonne MacHugh, says he is "struggling now" after several months in jail. "Every month there is hope, followed by disaster. Every time there's a court hearing, there is always something that blocks them," she said. Each of the 35 sailors received a five-year jail term and was ordered to pay 3,000 rupees (£30). A Foreign Office spokeswoman said: "We recognise what a difficult time this is for those involved and we have taken significant action on this case. "The prime minister has been clear that she intends to raise it with Prime Minister Modi during her visit next week. "Alok Sharma, the Foreign Office minister for Asia, pressed for progress during his first official visit to India in July, and again last month. "Earlier this year, the then-Foreign Office minister Hugo Swire travelled to India to meet the men personally, as well as meeting their families in Carlisle". The spokeswoman added that the Foreign Office had been providing ongoing support for all six men and their families and it is "working to make sure the men's welfare is protected in prison".